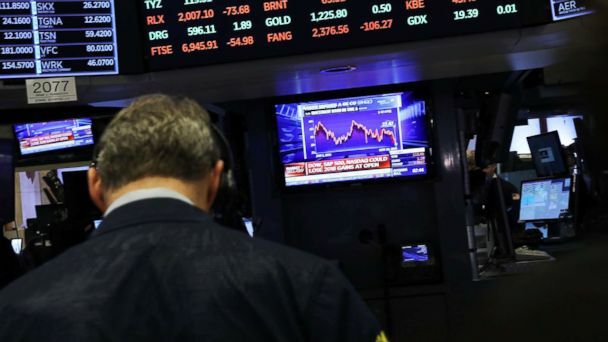 The Dow Jones industrial average plunged more than 551 points on Tuesday, dragged down by disappointing Target news and concerns about the retail sector in general ahead of the pivotal holiday season. Tuesday's slide compounded Monday's losses on the Dow, resulting in a two-day losing streak of about 950 points, or 4 percent. Stocks fell 2.2 percent on the Dow on Tuesday alone. All of the major stock indices are now in negative territory for the year, after posting record highs. The S&P 500 Index hit a level nearly 10 percent below its September record close before recovering. The turbulent and tech-centric Nasdaq Composite Index was almost 14 percent below the closing high it reached in August. Target stock tumbled 11 percent after reporting weaker-than-expected earnings for the third quarter. The news spooked investors and, combined with disappointing earnings from Victoria's Secret parent company L Brands and Kohl's, provoked worry just ahead of Black Friday. Retail stocks, in general, took a hit. As recently as September, Target had said it would be hiring 120,000 seasonal workers for the holiday shopping season. The Nasdaq ended the day 120 points -- or 1.7 percent -- lower, at nearly 6,909 points. All eyes were on Apple, whose shares were down 4.8 percent to close at $176.98, adding to previous losses amid reports of weakened iPhone demand. Goldman Sachs issued a bearish report on Tuesday morning, in line with other reports. The company recently announced it would no longer disclose unit sales of its iPhones.